As a result of Congress’s failure to come up with a $1.2 trillion deficit-reduction plan, automatic spending cuts or “sequestration” set by the Budget Control Act of 2011 (BCA) is set to take place from 2013 to 2021. As the threat of sequestration looms, concerns about cutbacks in defense spending have become a significant issue surrounding debates tied to national security and American jobs. To understand the effects of sequestration on future defense spending, it is important to understand how the BCA spending caps and sequestration apply to the base defense budget alone and when war spending is considered. The expansion of the defense budget starts with the Department of Defense’s base budget (green region), which is the legal amount of spending approved by Congress. The base budget does not include war costs – categorized as Overseas Contingency Operations (OCO) – for military operations in Afghanistan, Iraq, and other defense operations. Therefore, the additional costs for funding wars (blue region) are included in the chart to establish a full picture of defense spending. Projections outlining the future path of the defense base budget are depicted by combining the red and purple regions, which represent the defense base budget if spending is capped under levels stated in the BCA. 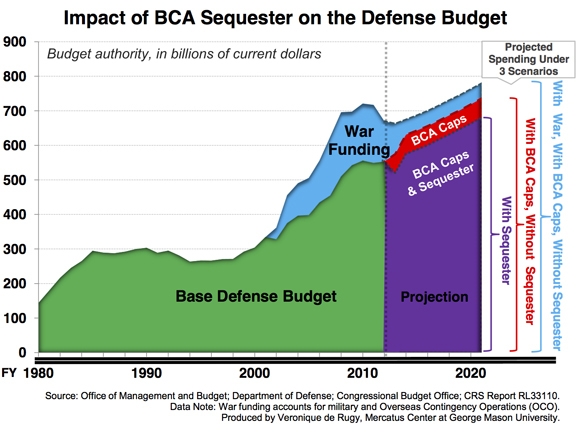 Taking away the red region and leaving the purple region shows the projected base budget if sequestration occurs in tandem with the BCA caps. And, lastly, adding the blue region to the red and purple combined accounts for future base and war spending. 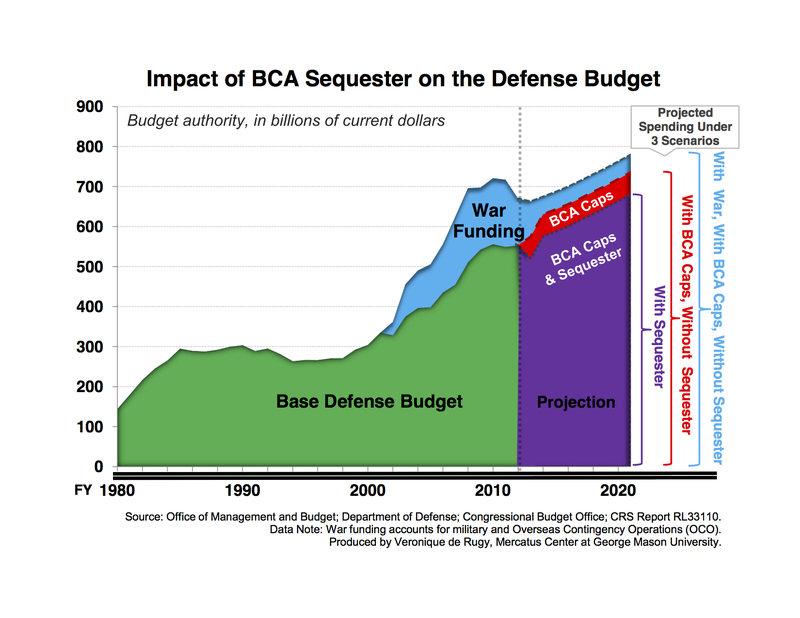 One important factor in weighing the effect of sequestration is that war spending (OCO) is not capped to meet certain spending levels outlined in the BCA. In other words, Congress can set the level of OCO spending above and beyond what is needed in anticipation of the impact of the sequester and caps on defense spending. So while there is uncertainty about the application of the sequester on war spending (see this article in The Hill), it is guaranteed that there are preemptive measures that policymakers can take to limit sequestration’s effect: propping up war spending to make up for losses in non-war accounts. As the chart shows, defense spending has almost doubled in the past decade in current dollar terms and will continue to grow in spite of automatic cuts set by the BCA. Clarifying these figures reveals that sequester cuts do not warrant the fears of policymakers who warn about “savage cuts” to the defense budget. Note on the data: This chart shows defense budget authority or departments’ and agencies’ legal authority to spend. This metric is distinct from budget outlays, which represent actual spending amounts. Historical data on the defense department’s legal authority to spend, also known as budget authorities, comes from the Office of Management and Budget. War spending figures are from a report by the Congressional Research Service and the Department of Defense. And projected budget authority with and without defense cuts are from the Congressional Budget Office. The origination of the chart is inspired by the following CQ Weekly Cover Story, “Wiggle Room for Cuts?” by Frank Oliveri published on August 4, 2012.